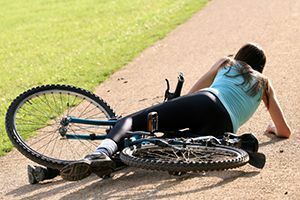 A 25-year-old woman is listed in stable condition after a semi-truck collided with her bicycle as she was riding down 400 West in Salt Lake City, Utah. The accident occurred early Thursday morning at the intersection of 300 North and 400 West, near West High School. According to witnesses, the semi-truck was turning left onto 400 West when it struck the woman, causing her to fall from her bicycle. After falling, the woman hit her head on the pavement and was dragged several feet by the semi-truck. The semi-truck driver made no attempt to stop or slow down at any time during the incident; therefore local authorities are treating the truck accident as a possible hit-and-run. However, because semi-trucks are large and often cumbersome to navigate, it is possible the driver did not even realize a collision occurred. The semi-truck in question is described as being red with a long, flatbed trailer. The trucks license plate number or license plate state of issue is not known. The Salt Lake City Police Department encourages anyone with information about the semi-truck to come forward. If you have any information regarding the truck accident, you can contact the Salt Lake City Police Department directly by calling 1-801-799-3000. According to the National Center for Statistics and Analysis (NCSA) and the National Highway Traffic Safety Administration (NHTSA), nearly 13 percent of all trucks on the road today are semi-trucks, which makes semi-truck accidents a very real and serious concern. NCSA and NHTSA have compiled the following statistics regarding semi-truck accidents in the U.S. If you or someone you love has been the victim of a semi-truck accident, you need to seek the help of an experienced and skilled truck accident attorney. Contact the dedicated truck accident lawyers at Phillips Law Group today to schedule a FREE initial consultation. Our personal injury attorneys Phoenix, AZ have decades of experience making sure your rights are protected and enforced at all times. Call or text 1-800-706-3000 for a FREE consultation today.